On the surface, it seemed like the situation that has come to be known as AngelGate was dying down. Since we broke the news about the secret meetings between angel investors where they supposedly agree to agree on things, a lot has been said on both sides. Mike said what he knew, and one of the angel investors present at the meeting he crashed, Dave McClure, came out in opposition to the allegations. But things have gotten more interesting this evening. McClure sent out a tweet earlier that was clearly meant to be a direct message. It read, “Ron is throwing us under a bus. and it’s chickenshit that he writes that after David Lee comes to both meetings.” He quickly deleted the tweet, but not before plenty of people saw it, responded to it, retweeted it, and it was syndicated elsewhere. It doesn’t take someone deeply engulfed in the situation to figure out what McClure is talking about. Clearly, Ron Conway, founder of SV Angel and the most prominent angel investor in Silicon Valley, sent an email to other angels involved in the situation. 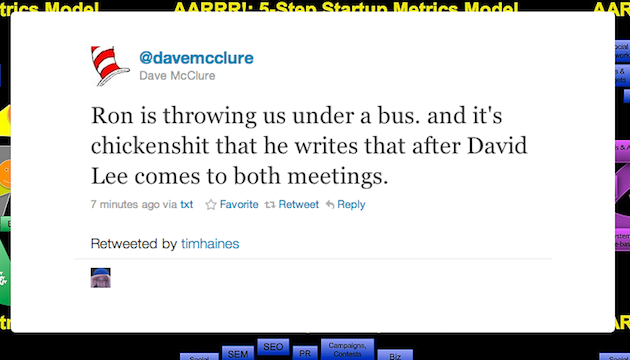 Clearly, that email was in opposition to McClure’s stance that those at the meeting were doing nothing wrong. David Lee, who McClure mentions, is a partner at SV Angel and was at the meeting. McClure’s tweet also confirms that there were two meetings of these angels. Mike showed up to the second one. McClure has since tried to play off his failed DM. “sigh. bad day. sorry folks,” he tweeted immediately after he deleted the tweet. “well so much for the slow news day,” he then tweeted right after that. Indeed. Expect more fall-out from this in the coming days. Update: And here’s the email from Conway.